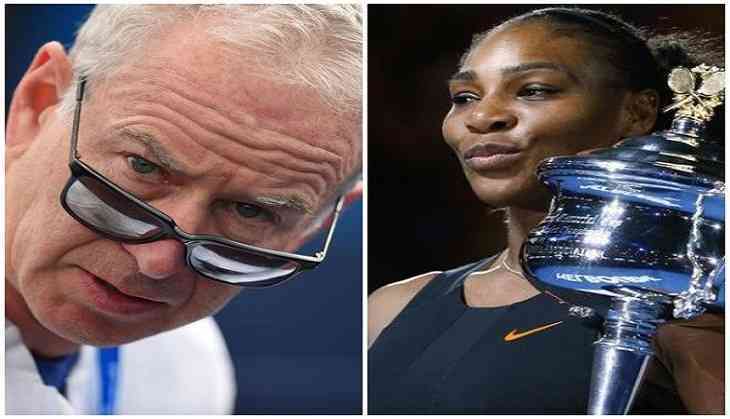 The off-court match going on between John McEnroe and Serena Williams doesn't seem to end as the tennis legend has refused to apologise for his comments about the 23-time grand slam champion and believes men should play against women to settle the argument. McEnroe had claimed that Serena, who is the best player of her gender, would be ranked 700 if she plays on the men's circuit. Following which the Serena had said that McEnroe should respect her and her privacy and should abstain from making comments that are "not factually based". "I felt the need, however unfortunately, to defend myself and say what I really felt, which is about what I think she would be," The Sydney Morning Herald quoted McEnroe as saying. "I've got a solution. Solve the problem, and I'm sure the men would be all for this - the men and women play together. And then we don't have to guess." When asked if he would like apologise for his comments, the tennis legend said was emphatic in his response. "No. I didn't know it would create controversy. I've said this 1000 times. I don't want anything to go wrong with Serena because she's pregnant. I don't want to upset her," he said. "I think she's doing it tongue in cheek as well and I think deep down we're talking about something... I can't even believe we're talking about it," he added. McEnroe, seven-time major champion, speaking as part of a tour to promote his new book 'But Seriously', had said that while he has great respect for Serena, he would place the 23-time Grand Slam winner "like 700 in the world" on the men's circuit. "Best female player ever - no question." "If she had to just play the circuit - the men's circuit - that would be an entirely different story," he added. However, Williams on Monday hit back at McEnroe and wrote on Twitter, "Dear John, I adore and respect you but please please keep me out of your statements that are not factually based." "I've never played anyone ranked 'there' nor do I have time. Respect me and my privacy as I'm trying to have a baby. Good day sir," she added. The American has already made it clear she is determined to return to the tour next year, with Margaret Court's all-time record of 24 slam singles titles an obvious goal. In April, she had announced that she was pregnant and would not compete for the remainder of the season. Serena became the oldest woman to win a grand slam when he won the 2015 Wimbledon title at the age of 33. The 35-year-old tennis star has 23 grand slam singles crowns and 14 doubles titles in majors.